Identify the underlying principles guiding v4’s new perquisites and credits. Appreciate the fact that designers will have to be more resourceful and innovative to meet more stringent energy and water efficiency requirements. Describe how v4 seeks to promote product transparency and its ramifications on the building products industry moving forward. Explain the intent and goals of utilizing an integrative project process. Considered to be the most significant revamping of the LEED credit system, although not without its critics, many are applauding the new and improved LEED v4 (v4) as raising the sustainable building bar and continuing to drive market transformation. 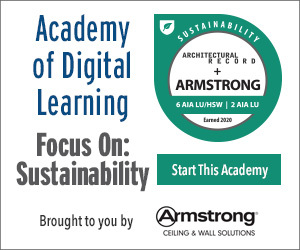 “This new version of LEED raises the thresholds in categories that truly needed change to maintain LEED’s role as a leader in sustainability standards, as well as current reference standards,” states Jeffery Saad, AIA, LEED AP, vice president, director of design, HKS, Chicago. “While it has been a long time in development, including an unprecedented six comment periods, the end result is a robust, challenging and widely agreed upon step forward,” agrees Courtney Lorenz, director of environmental management, Skanska USA, Durham, N.C.
By increasing energy and water efficiency thresholds and introducing a new Demand Response (DR) credit, for example, Saad sees LEED’s overall focus as evolving from reducing negative environmental impacts to targeting zero impact. LEED v4’s new and updated credits and prerequisites are guided by the following underpinning impact categories. In fact, LEED’s underpinning structure has shifted from avoiding negative impact categories to improved environmental outcomes. Essentially, v4 will now evaluate building projects based upon their ability to: reduce contribution of carbon emissions; enhance human health and well-being; protect water and biodiversity; promote regenerative resource cycles; build a green economy; and support improved community-level quality of life. Considered to be more technically rigorous, v4 has rebalanced its point structure, assigning the highest values to credits that will most significantly further one or more of these aforementioned goals. Other significant broad-scale changes include new market-specific rating systems, more simplified submittal requirements, enhanced reference materials and online tools, and more intuitive documentation forms. Now providing rating systems for 21 different building types, the USGBC has added data centers, warehouses and distribution centers, hospitality, existing schools, existing retail and mid-rise residential buildings to its LEED portfolio. “I think the approaches of standardization, updating of credit weightings and increased building information management add up to a system that makes sense and makes a difference. It is a well-balanced step forward, with a mixture of familiar approaches and new ‘reach goals,’” says Lorenz. “That being said, this has been the most highly contested version yet, so the speed at which all members of the green building community start to use this program will be an indicator of its success,” he adds. Perhaps one of the more controversial changes has been the inclusion of Life-Cycle Assessment (LCA) data, as verified by Environmental Product Declarations (EPDs). Intended to significantly drive building product disclosure and transparency, specifiers and contractors are enthusiastically applauding this move, although many are nervous about the extent to which the building products industry will have to scramble to assemble, verify and publish the required data. “Rather than relying on single attributes of products—such as recycled content, biobased content or reused material—v4 encourages manufacturers and consumers to consider the product of material from the perspective of understanding life-cycle impacts, i.e. environmental, human and ecological impacts of production,” explains Chrissy Macken, v4 assistant project manager, USGBC, Washington, D.C.
Life-cycle cost of a system is an important part of the equation when considering mechanicals, like a heating and cooling system. A geothermal heat pump system, while more expensive upfront, can more than pay for itself through reduced energy consumption, reduced maintenance, the ability to generate all or part of a building’s hot water requirements and long system life. Add to that the available 10 percent federal tax credits and modified accelerated depreciation, and payback calculation can really be swift. As noted, the USGBC took its time with the development of v4 in order to solicit and consider a significant level of industry feedback. In particular, more than 23,000 public comments were registered from November 2010 to March 2013. Furthermore, the introduction of this most recent version, originally slated for 2012, was pushed back a year so that v4 could incorporate some of this important feedback. “The process was completed in a consensus-building and transparent way that anyone in the building industry could follow,” explains Andrew Zumwalt-Hathaway, USGBC LEED Faculty, LEED AP BD+C, director, sustainability consulting services, Steven Winter Associates, Norwalk, Conn. In addition, a number of Technical Advisory Groups were established to seek input from a variety of industry professionals. “I would say there are many who are not happy with v4 as it is, but the fact that people have been forthright in sharing their thoughts through the numerous commenting periods and getting their voices heard is a success story on how the building industry has been engaged in the entire process,” states Judhajit Chakraborty, LEED AP BD+C, built ecology, WSP, San Francisco. Yet another tool which the USGBC deployed was the establishment of a Beta program where a couple hundred building projects tested out v4 and then the project teams provided feedback on how to make the new system more usable. USGBC then responded with corresponding revisions to reference guide. Of course, v4 also taps into insights garnered from thousands of projects dating all the way back to LEED’s inception. Ultimately, v4 was approved by 86 percent of the consensus body, so the USGBC is confident that market adoption will be broad. Before delving into more details regarding v4’s changes and how they will impact projects seeking LEED certification moving forward, it’s important to note that the USGBC has opted for a gradual phase-in so that project teams have ample time to get up to speed on the new requirements. Consequently, projects will still be given the option to register under LEED 2009 until as late as June 2015. At the same time, the USGBC anticipates that building owners will embrace v4 sooner as opposed to later. “Organizations that want to differentiate themselves as continuing to advance the evolution of the green building industry are going to gravitate toward v4 because it’s going to be a significant market differentiator,” explains Brendan Owens, vice president, LEED technical development, USGBC, Washington, D.C., in the “Key Concepts & Strategies” webinar. While a number of credits have been moved, renamed or combined, v4 does maintain the same structure and should be familiar to LEED users. At the same time, the new version places much more of an emphasis on accountability and performance verification. Consequently, v4 directs the creation of feedback loops to make sure that the building is actually performing in line with the original design intent. For example, building-level energy and water metering have been upgraded to a prerequisite, and a new Advanced Energy Metering credit requires metering of all energy end-uses representing 10 percent or more the building’s total energy consumption. LEED has provided an avenue for codes to become more rigorous at a much faster rate, as shown here with increasing Energy Use Index levels of each ASHRAE 90.1 release directly corresponding to subsequent LEED versions. Perhaps one of the most ambitious changes in the Energy & Atmosphere categories is the inclusion of ASHRAE 90.1-2010, in place of the previous 2007 version, and the fact that close to 20 percent of the system’s credits are centered around energy-efficiency levels. And although the minimum energy cost savings threshold has been reduced from 10 percent to 5 percent better than 90.1-2010, in response to concerns that the originally proposed 10 percent was too aggressive, the new energy efficiency levels are still quite high. Mara Baum, AIA, LEED AP BD+C, senior associate, sustainable design leader, healthcare, HOK, San Francisco, agrees that reaching this level of energy efficiency will require more innovation, but the building technologies capable of achieving these goals are not new or untested. For example, Baum anticipates seeing more systems that decouple heating and cooling from ventilation requirements as they tend to keep occupants more comfortable while using considerably less energy than equivalent all-air systems. Incorporating a geothermal heat pump system is one way buildings can realize a 30 to 40 percent energy reduction versus the standard ASHRAE 90.1 building by allowing the natural and consistent temperature of the earth to do a large portion of the heating and cooling required. Generally speaking, HKS’s LEED Green Associate Branden Clements anticipates that designers will have to place a greater focus on systems working synergistically. For example, capturing waste heat with airside energy recovery systems and then reusing that heat. As a side note, he mentions that ASHRAE 90.1-2010 provides economizer exemptions if specific efficiencies are reached, which offers greater flexibility to the designer. In addition, under the LEED O+M rating systems, existing buildings seeking v4 certification will be required to achieve an ENERGY STAR score of at least 75. Recognizing the limited opportunities that existing buildings have in the arena of energy efficiency improvements, a new pilot credit called Energy Jumpstart offers and alternative path of basic certification for buildings which can demonstrate a 20 percent reduction over an established baselines during a 12-month period. The increased energy performance requirements offered by LEED v4 can be accomplished by using a water source heat pump system. The inherent recycling of energy through a water source system allows heat from one part of a building to be recycled and used in a different part of the building. For instance, often times the core of a building needs constant cooling even in winter months; the heat extracted from the core of the building can be transferred to the perimeter of the building and used to heat those spaces. Some other HVAC technologies which designers expect to see more of include chilled beams, variable refrigerant systems, solar hot water heating, mechanical units and refrigeration equipment with higher SEER ratings, according to Lorenz.